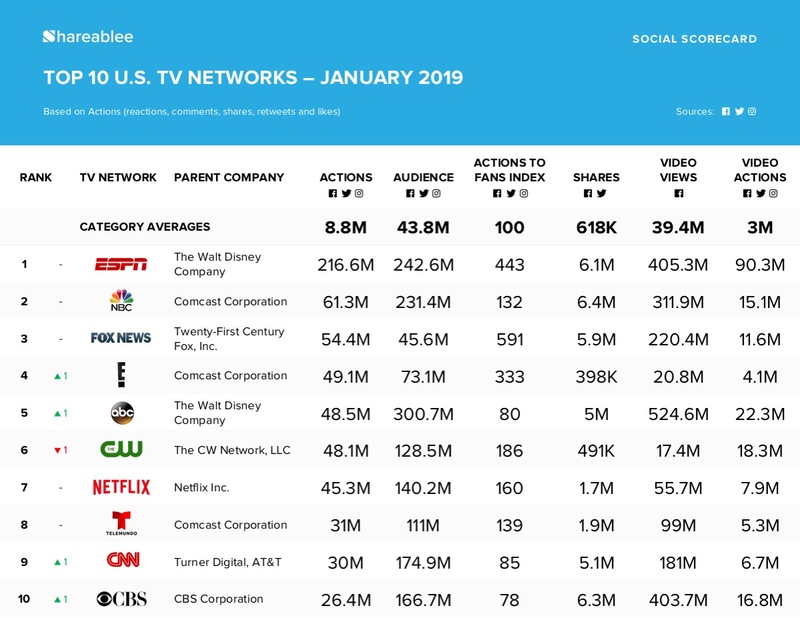 NEW YORK, February 7, 2019	(Newswire.com) - Shareablee Inc., the global leader in audience-based social media measurement, today released their ranking of the most socially engaged American TV networks for January 2019. 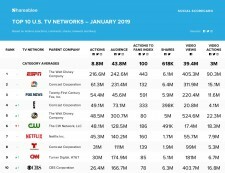 The ranking includes all television shows and all main network brand accounts under their respective networks, which increased 20.1 percent in overall engagement and reflected a total of 865 million actions (post-level reactions, shares, comments, retweets and likes) across Facebook, Twitter and Instagram over the last month. Disney’s ESPN earned the top ranking last month with 216.6 million cross-platform actions — which represents an impressive 70 percent greater number of engagements vs any other TV network. Namely, NBC ranked second with 61.3 million actions. FOX News came in third with 54.4 million actions, followed by E! (49.1 million actions) and ABC (48.5 million actions). Shareablee is the leader in audience-based social media measurement for media publishers, agencies and brands that want to understand the impact and effectiveness of their cross-platform social media campaigns. Launched in 2013, Shareablee empowers brands by providing data that can help them define and drive success on social media by arming them with metrics and predictive analytics that inform powerful best practices. Shareablee is the leading authority on audience intelligence, competitive benchmarking and actionable insights with clients in more than 15 countries.